With a spacious courtyard and high ceilings, this riad is sunny and elegant. 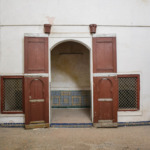 Already structurally sound, the riad awaits an attentive restoration. Ground floor: 2 salons 25m2 & 15m2, kitchen 10m2. In between levels: 2 rooms of 10m2. First floor: 2 rooms of 25m2 & 50sm2 each.